The schema from source workflow, discussed in the previous example, will read and write any data in a single workspace. However, the output is always a mirror image of the input, as the destination schema is copied dynamically from the source. Instead of creating a mirror image, it is possible to map the source data into a new schema, and write that dynamically. This is useful to enforce a particular output or when the desired schema already exists. Any Reader dataset – in any format – can be used as the source for the destination schema by adding it as a Resource Reader. In this example, an ongoing project provides updated city data in the form of a standardized set of shapefiles. However, each time an update is received, it is in the Autodesk SDF database format. To handle this scenario, a dynamic workspace is created using the standardized shapefiles as schema resources. In the image above, “InteropolisDatabase” is the original source dataset, and has been replaced by the Shapefile resources. Select OK and close the dialog. Below is an image of the final workspace. Use the run button and then check that the output files contain the correct attribute schema. 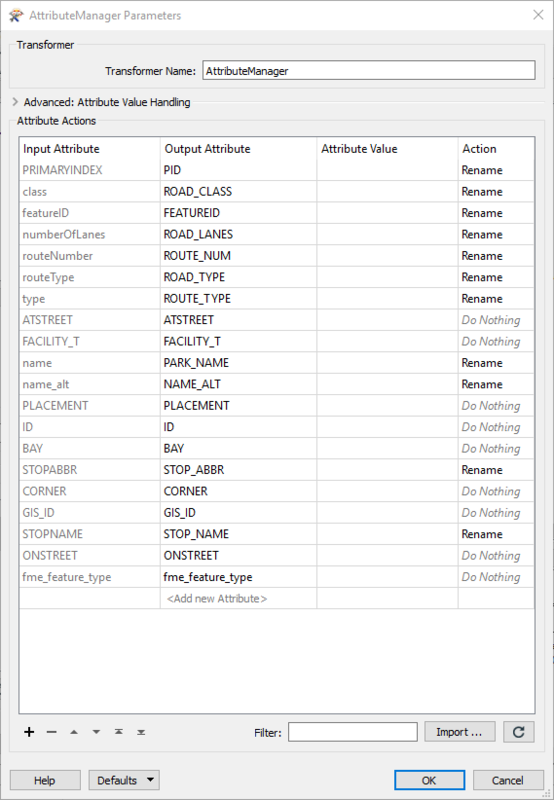 The feature types defined by each selected Schema Sources will be logged. The first two attributes come from the Shapefile and the other two from from the SDF. Click ok and re-run the workspace.